I am new to hunting with subsonics. I'm using a 300 BO with suppressor to stay quite and effective. I know that a bullet that stays intact and yaws after impact can be lethal but there can be situations were not much energy is transferred. I wanted to find a bullet would reliably expand at subsonic velocities to improve terminal performance on hogs and deer. I found this all-copper bullet, the 195 MKZ from CavityBackBullets.com, for my subsonic loads. I've tested it with my bullet traps and confirmed it opens up down to 700 fps with 3-pedals. Its like a mechanical broadhead for a rifle. At a 1060 fps muzzle velocity, this 195 grain bullet has 485 ft-lbs of energy, about a 1/3 of what a supersonic 6.8mm has. To follow is what my experience has been so far. I’m interested in comments, discussion, and sharing of other’s experience with subsonic hunting. I have shot a turkey head on in the chest at 75 yards with the 195 MKZ two weekends ago. It rolled the turkey which then ran 15 yards before going lights out (not a flap). The entrance wound was about the size of a quarter. It looked like some exit wounds. The exit wound was a hole I could stick my finger through but not gaping like the entrance. With no fragmentation, there was minimal meat damage. I wanted to be confident with what to expect with the 195 MKZ for larger game. So I decided to see if I could drop a large boar and use it to test the 195 MKZ’s terminal performance. Below is the last Sunday evenings activities. The boar was bigger than it looks in the picture because I was standing in front of the head looking back. The boar was easily a foot longer than the rifle with suppressor. I estimate it was 250+ pounds. It is the second largest hog I've shot. Since I was hunting just before sunset and didn't want to risk having to track a hog if I shot it with the 300 BO, I chose my 20" APR with 105 MKZ to hunt with. The 105 did the job with a neck shot. The boar dropped right there and never took a step - range was 105 yards. I must have hit the spine because the 105 did not have an exit wound. I then rolled the hog over and took 3 shots with the 195 MKZ on the body with one in the abdomen, one through the chest for penetration performance thru the ribcage, and the 3rd through the boar's shield and shoulder blade. None were pass thru's. Each entrance wound was identical as shown in the picture - like a leather punch had been used to cut a 3/16" hole in the boar's hide. None of the bullets were pass thru’s. I found the two bullets shot through the abdomen and rib cage having full penetration and logged against the far side hide. I was surprised to feel that much thickness of tissue and fat on the outside of the ribs as my finger was several inches in. I had to cut away to finally retrieve the bullet. The one through the chest looks like it had turned after expansion and two of the pedals had been bent back toward their original position. The bullet shot through the abdomen had fully expanded with two of the pedals bent back excessively. I would guess hitting the outside hide bent them back (just a guess). So essentially the far side hide was elastic and contained the bullets. I've seen this hide interaction before with SSTs on deer where the fragments tear a hole in the offside ribcage that was big enough to run your fist through but no fragments penetrated the off-side hide. This boar’s hide was much tougher than a deer hide. Based on this evidence, I would expect the 195 MKZ to have pass through penetration on a deer. Oh, the bullet through the ribcage/chest hit the liver and had indications of a Tri-Star wound cavity that tore the liver into 3 ragged pieces. Edit: no sooner than I posted this, I realized that I should redo this test for more accurate results. Though the bullets did not have pass-through, that could have been due to the elastic hide capturing the bullet or I may not have rolled the hog up enough and there could have been ground contact under the area of the bullet exit. Expansion and depth of penetration is still valid. When I cut open the diaphragm, a significant amount of blood rushed out. It was getting dark so decided to call it and wrap things up. I’ll go back and check the carcass for the remaining bullet next weekend. I was pleased to see the penetration on this large a hog. I’m not surprised that a bullet with that much frontal area was captured by the hide. 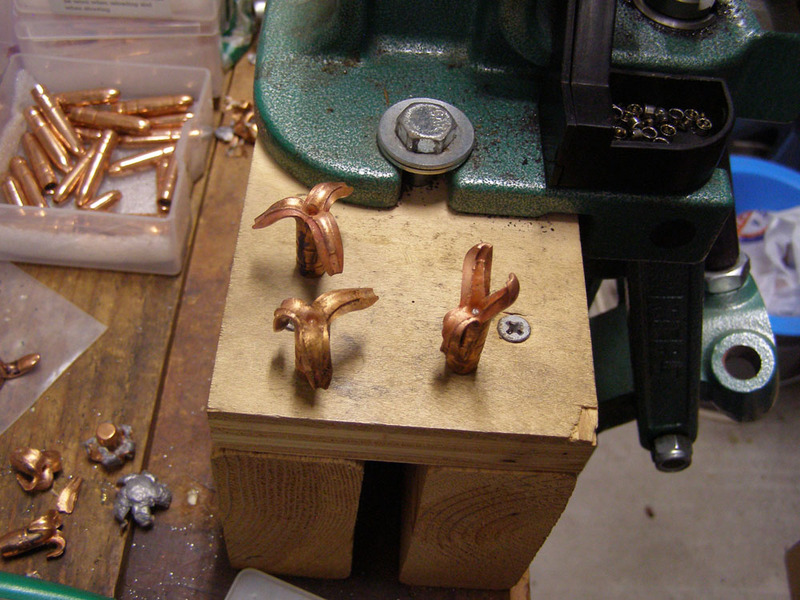 Here is a picture of the bullets on my workbench. 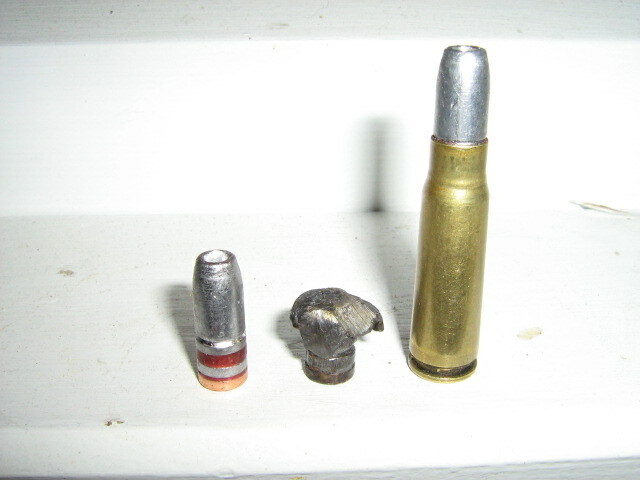 The bullet on the back left is from the initial bullet testing shown in the first picture. these are 151grn cast .308 cal projectiles that cost me $15 per hundred!!!!!! Elvis, what have you put those calipers through? You have put those through some tough times! Looks like you achieved about a 1/2 inch expansion. 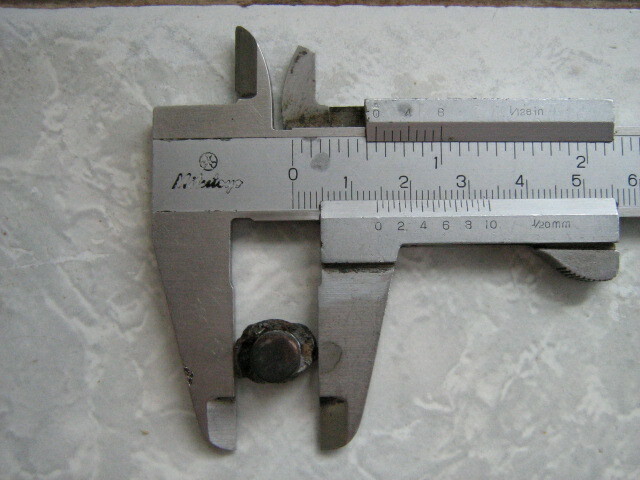 The 195 MKZ had 1 1/4 inch expansion. Are you getting pass through penetration on your deer size game? You also brought up cost. The MKZ is about 2/3rds the cost of the Leigh. But I stop considering the cost of a bullet when looking for an effective hunting solution because the bullet cost is the smallest fraction of what it takes to go hunting. By the time you add in the cost of a lease, hunting clothes, weapon, gas to get there, food for the trip, the cost of the bullet doesn't show up on the scale. It's unfortunate that here in the UK, subsonics are proscribed for hunting any game animals bigger than rabbits, as there are specific rules regarding bullet velocity & muzzle energy which rule them out. I'm pretty sure a correctly designed, .30 calibre, 180gr bullet at 1080fps would be at least as effective as a 100gr .243 calibre bullet at 2,800fps at the usual stalking distances here. Texas has no restrictions. I believe some states do but it is mostly caliber or cartridge length. Subsonic bullets don't bleed velocity like a subsonic bullet does. The 195 MKZ only drops 60 fps every 100 yards where most of my supersonic bullets can drop as much as 300 fps in that distance. So the subs retain what energy they have very well except their velocity is so low that their trajectory drops off rapidly. I'm calculated to get almost 3 feet of trajectory drop at 200 yards with a 50 to 75 yard zero. My 270 goes 450 yards before it has that much drop. I've got some learning and practicing to do before I start going beyond 100 yards. ok...... here is the fly in ointment with subs. without shock you are basically using an arrow without broadhead. if you miss vitals...youve missed and wounded animal can move off rapidly appearing unhit. slimjim Ive used these for headshooting sheep for house mutton (my own sheep Im not stealing someone elses) ranges are usually about 40 yards. we have retrieved exzacary 1 projectile and that wasnt intentional...we had cooked neck chops and tipped juices out into dog dish and found that projectile in there. I doctor projectiles to prevent over penertration,adding slits/cuts to rim of cavity to form X about 3mm deep. they will go through nose side on and jaw side on...... both those near misses really opened my eyed to the down side of subsonic. a super would have knocked animal about dazed it at least...not so with subs they just shook head and carried on. havent tried body shot as not the done thing on house mutton dont you know... would happily shoot fallow / goat sized animal in chest but would expect animal to move off before expiring. they work well on wallabies but they arent really hard to kill if you hit them right. rabbits,hares and possums dont argue with them at all. they are same shape as .22lr power points as made by winchester and preform along similar lines just nearly 4 times heavier. I cant see point in using them at distance...... far safer to use normal load. great fun to use,great plinking round,great for recoil sensitive people, great for finishing shot. ok for big game if you are carefull. now the fellas using .45/70 subsonic have even less to worry about as they have big hole and heaps of weight for penertration......its a bit like using FMJ as you only get a small hole/bullet path..... there is no cavity created around bullet path to cause more damage as it collapses inwards. sorry for long winded rant but this is a subject that needs to be talked about for sake of games welfare. I have read reviews that say they are dropping deer with broadside lung shots on the spot or they expire in less than 20 yards. With the 3-pedal expansion the 195 MKZ is achieving, I believe it is relying more cutting than on shock. I think I have patterned another Bore on the hunting lease. I will try and take him next week and repeat this test to double check penetration/pass thru as well as document internal damage better. slim...you know as well as I do that a deer DOES NOT drop on spot from a broad side lung shot UNLESS you take out bone....shoulders..... yip expire within 20 yards is settled but a worked up animal that is lung shot with out hitting shoulder bones can travel a fair bit further than that. the pills you are using look great but they arent magic bullets,your testing with monos over the years has been great and you convinced me to give them a whirl in both the .223 and the .270 they are good for sure but cant do anything the likes of a partition cant do as well if not better. but on the other hand: we are not allowed to use lead shot and I allready heard about sheep that died because ironoxide entered their blood-system (due to ricochet). And what about the guy who got steel shot oxidised together to 1 big lump in his appendix... he almost died. And doesn't it feel strange that lead is banned as (ingredient of) projectiles while some armys use radioactif material because it's even heavier? And don't they use leadsalts anymore as active ingredient of agricultar spraying stuff? As for me: anorganic products still seem to be more honnest poison than most organic stuff that causes cancer or other diseases on longer terms.